Given the continent’s reliance on Russia as a source of natural gas, would it not be logical for Europeans to start producing their own shale gas? After all, we have seen what the effects have been in the US with regards to energy prices. In March, researchers at E3G looked into the matter and found that the success of shale gas in the US is overstated and not transferable to Europe. Craig Morris investigates. Then comes the myth-busting. First, it will not be cheap. E3G found that fracking in Europe would produce shale gas at roughly twice the cost of production in the US. The reasons include more favorable geological conditions and “relaxed environmental regulation” in the US. Oil firms have realized the difference, which is why several have already pulled out of Poland, which is estimated to have the largest shale gas reserves in Europe. Furthermore, as I have pointed out previously, low gas prices in the US are partly the result of a lack of interconnection; firms are simply producing more gas than pipelines can handle. That won’t happen in Europe, which has better natural gas connections. Third, the estimate of 10 percent of supply is optimistic; a more conservative estimate is 2-3 percent. At that rate, domestic shale gas production is a drop in the bucket and will hardly offset gas imports. Finally, E3G doubts that shale gas will be useful in reducing carbon emissions. The analysts point out that methane leaks have been grossly underestimated. Furthermore, they expect any production of shale gas to offset renewables, not coal power, in the political and market reality of Europe. My favorite part comes when the analysts show that the chemicals sector in North America actually shrank from 2005 to 2010 during the beginning of the gas boom, while the sector grew in the EU. I wonder, however, what the figures look like since 2010. So what should the EU do? 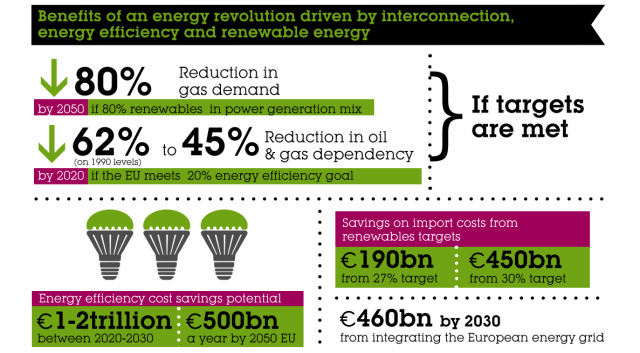 E3G cites the European Climate Foundation, which “found that combining large-scale deployment of renewables with improved energy efficiency and greater interconnection of the European grid could reduce carbon emissions 80 percent by 2050 and power generation gas demand in the EU by 80 percent” relative to 1990. Craig Morris (@PPchef) is the lead author of German Energy Transition. He directs Petite Planète and writes every workday for Renewables International. Infographic by E3G and retrievable in one piece here.